Kenneth P. LaValle Stadium had been an unbreakable fortress of dominance for Stony Brook Women’s Lacrosse over the last three seasons. The Seawolves thrived off the energy from the Long Island faithful and converted it into victories, winning a program-record 33 consecutive home games. Anticipation for the 2019 home opener against the Stanford Cardinal with the expectation of winning helped draw fans to the stadium and hype up the team. 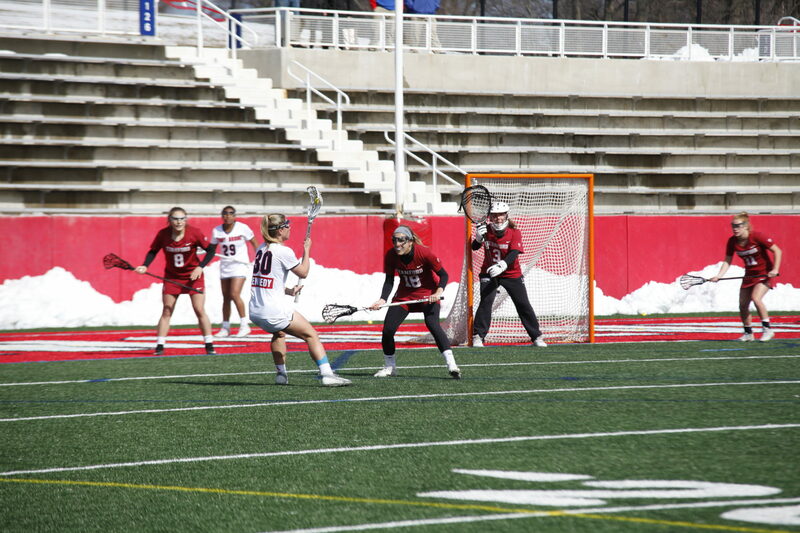 However, Stony Brook’s triumphant home performance stretch screeched to a halt as the Cardinal topped the Seawolves, 15-12, on Sunday, March 3. The home loss was the first since the 7-6 heartbreaker against No.3-ranked Florida on March 6, 2016. That was also the last time Stony Brook began the season 2-2 under head coach Joe Spallina. Stanford sophomore attacker Ali Baiocco led the offensive charge throughout the contest and finished with six on the day. Baiocco’s first unassisted goal extended Stanford’s scoring run to three consecutive goals and resulted in an early Stony Brook timeout call. Stony Brook fell 5-1 after the timeout, but battled back with five consecutive goals through the closing minutes of the first half, taking the 6-5 lead. When the Cardinal fired back with a score, the Seawolves responded with a last-second goal by senior attacker Nicole Baretta off the assist by sophomore attacker Jesse Arline and regained the lead. Stony Brook kept the momentum early in the second period, but Stanford countered with four-straight goals and took the lead. The Seawolves had one final offensive push, tying the game at twelve, but the Cardinal closed out the contest with three goals capped by Baiocco. The sophomore blazed through the Stony Brook defense and rocketed six shots through the back of the net for the game. The rain came down throughout Friday night, but the goals did not drop until the half nearly ended. Sitting narrowly on a 4-3 lead for around 13 minutes, the Seawolves picked up two late goals opening the second half with an immediate score and pulled away from the Towson Tigers on Friday, March 1. Stony Brook continued the high tempo throughout the second half and walked away with the 14-8 victory. Senior midfielder Carlee Janelli began the Seawolves run by forcing a turnover with under a minute remaining in the first half and passed the ball ahead to Arline. The sophomore completed a pass to senior midfielder Keri McCarthy, who found the net and put the Seawolves up two. Junior midfielder Ally Kennedy forced another turnover and fast break 30 seconds later, and the ball found Arline in front of the goal this time for the 6-3 lead entering halftime. Kennedy won the draw to start the second half and blazed through the Tigers defense, scoring unassisted. Kennedy led the team with four goals on the night while senior attacker Nicole Barretta picked up a hat trick after entering the game with just one goal on the year. Arline led the team with four assists to pick up a career-high five points, and junior attacker Taryn Ohlmiller picked up three points, extending her team-lead to 13. Stony Brook held a 10-4 lead with 23 minutes left in the match, but Towson went on a run to make it interesting. The Tigers scored three consecutive goals, capped off by a free position goal by senior attacker Natalie Sulmonte to make things competitive, but the Seawolves defense suffocated the comeback by forcing five turnovers to close out the game. The Seawolves will begin a three-game road series, beginning with Princeton on Saturday, March 9 at 1 p.m.